A new train operator has taken over the running of the London to Scotland East Coast Main Line. 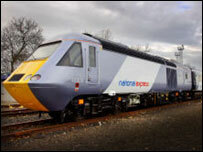 GNER had operated the service since 1996, but has now been replaced by National Express East Coast. The route was put out to tender last year, after GNER's parent firm said it could not pay £1.3bn it had promised the government to run the service. The new operator has promised to improve punctuality and spend £24m on new rolling stock. National Express beat off opposition from Arriva, First Group and a joint venture between Virgin and Stagecoach to win the contract. The route links London with Scotland, calling at Peterborough, Leeds, Doncaster, York, Darlington, Newcastle, Edinburgh, Aberdeen and Inverness. National Express agreed to pay the treasury £1.4bn to operate the franchise until the end of March 2015. The group, which also operates the Gatwick Express and Stansted Express, as well as One and C2c train companies, has pledged a new fleet of extra trains by the end of 2010 - delivering 14,000 extra seats a day. It has also promised a £7.4m package of station upgrades and a further £8m on station gating schemes, including automatic ticket gates at eight stations. Group chief executive Richard Bowker said: "Our plans for the franchise are ambitious and challenging and the customer is at the heart of them. "We have an exciting package of innovation and investment planned, which are aimed at making services attractive to many more people. "We will offer improved reliability, more trains and seats, easier ticketing and updated catering."